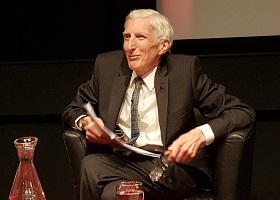 Lord Martin Rees, the astronomer royal, and former president of the Royal Society, recently attended the Edinburgh International Science Festival, and honoured GeekChocolate with a few moments of his time to share his thoughts on the future of space travel, the future of British science, and future of the planet. Please join us as we share in his insight and wisdom. Geek Chocolate – First question, and I apologise – what is the correct form of address when one speaks to you? 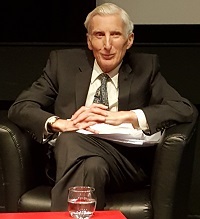 Lord Martin Rees – Well, formally it’s Lord, but I think just call me Martin. GC – Thank you, that’s very kind of you. In my lifetime, I have seen a great polarisation of the media. Television is either dumbed down reality shows or very highbrow drama, but unfortunately science on television is going the wrong way. Horizon isn’t the challenging and incisive show it used to be, nor do we get the excellent BBC2 Open University broadcasts on Saturday mornings. Much as we love the wonder of Brian Cox, it is popular rather than hard science. Is there still an audience for hard science on television, even if the networks don’t feel there is a market for it? LMR – I think your presumption is too pessimistic. It is true that there’s been nothing quite on the level of, say, the Bronowski programme from the seventies, but on the other hand I was very cheered up last month that in the same week one had a series from Brian Cox, which I thought was very excellent, and one from Jim Al-Khalili, and one from Marcus du Sautoy. To get three young scientists presenting excellent programmes was a real plus, so I think one shouldn’t be pessimistic, and that’s on the mainstream channels, and of course there’s far more available on the internet as well, so I think if people search for the good material, there’s more than ever, but of course it is heavily diluted by a whole lot of crap in a way that was not the case in the past. LMR – That’s right, yes. I think good science fiction does nourish our imagination. I should say I’m not a tremendous addict of science fiction, although I admired some of the great classics like Olaf Stapledon, from the 1930’s. GC – There’s Last and First Men and Starmaker? LMR – Yes, Starmaker, that’s my favourite, but Last and First Men, that inspired Arthur C Clarke and by a strange coincidence, he and the great biologist John Maynard Smith read the same copy of that book in the Minehead public library. I’m not a great reader of novels, and I very much appreciated a book a few years ago called Evolving the Aliens which was written by Ian Stewart and Jack Cohen, and it digested the plots of a whole lot of science fiction books and their themes, and I liked the idea of being able to get the essence of the plots without having to plough through all the books, because the plots are more ingenious than the writing is excellent in many cases. 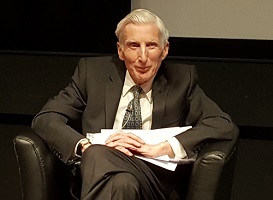 GC – While science fiction films were first fuelled by the space race, an argument could be made that, forty years later, the modern public are disillusioned by the reality of living in a future now arrived that doesn’t match the expectations we were promised. Do you think we have a viable future in space, and how would you rekindle public enthusiasm? LMR – There is, I think, not much future for space done NASA style, because it’s very expensive, and politics requires them to have a low-risk safety strategy, so I think that the future of most space is robotics and miniaturisation, and of course the last thirty years, the manned spaceflight to the space station has only made the headlines when it’s been a disaster. Apart from that, the main way the public has become enthusiastic is through the Hubble telescope, through the probes to the planets, and of course through the application of space to satnav and weather forecasting, so I think we shouldn’t be too pessimistic, but I do think that in the long run there will be people going back into space, but they will be going in a cut-price, high-risk fashion. In that context I am encouraged by the development of private companies in the US, the Space-X company, run by Elon Musk, who’s a very impressive engineer and entrepreneur, which has already put something into orbit. And I think these are setting the way whereby people can go back into orbit, in a private enterprise way, supported by sponsorship or by private individuals. It will happen eventually, but if you compare the situation now from forty years ago, then clearly manned spaceflight has not developed as fast as people thought, but that’s because robotics has developed faster, and because other technologies, in particular the power of computers, the internet and mobile phones, have developed amazingly fast. Even in the last ten years there’s been an amazing transition in the power of mobile phones and also the penetration of mobile phones worldwide. GC – Scotland is finally pushing forward with an aggressive renewable energy policy, both wind and offshore, but to my mind, this should have been done ten, twenty years ago. A decade ago, when the petrol strike crippled the country in days, I remember saying that within weeks of it being resolved, the government would announce alternative fuel initiatives to ensure it never happened again, but nothing happened. Why is there such inertia to good sense? LMR – Well, I think transforming the way we get our energy is of course long term and very expensive because the power infrastructure has a lifespan of thirty years typically, doesn’t it, and another ten years in the planning and construction. 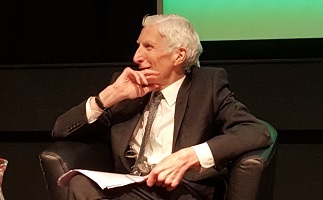 You’re right in saying that we need to start to change direction urgently, but even if we do that, then the impact of that change won’t come to fruition for twenty or thirty years, because that’s how long it will take to completely change our infrastructure. But certainly in Scotland, I would have thought, you could have a niche market in wave power, tidal currents, and of course, wind. GC – And of course, the technologies can be patented; it’s an investment waiting to make money. LMR – Well absolutely, I think it’s in our long term interest to be ahead in some of these technologies, because clearly other countries, particularly China, are heavily investing in some of them. 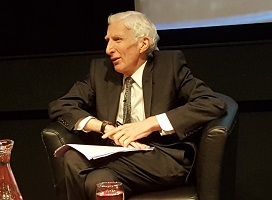 GC – I read in New Scientist that in America solar and wind farms are marketed for economical incentives rather than environmental considerations, as there is an ingrained resistance to environmental issues. To me, the question of whether global warming is man made or not is moot. When there is a better way to live, making less impact on the planet, we should adopt it simply because it is a better way to live. How do we go about opening eyes and changing attitudes? LMR – Well, I think you’re right that what is realistically going to happen is that these new energy generating mechanisms will become attractive and people will choose to use them, they’ll choose to have electric cars, just because they think they’re ecologically more friendly, and as a by-product, this will reduce carbon footprints. I think politically, our carbon footprints going to be reduced indirectly, because people choose to use machines that generate otherwise, rather than by laws limiting the amount of carbon emission. We have to hope that the technology develops so that people prefer to adopt it. GC – I certainly hope so. It’s recently been announced that the headquarters for the Square Kilometre Array project will be the historic Jodrell Bank Observatory. Considering the importance of this project, how big a coup is this for British science? 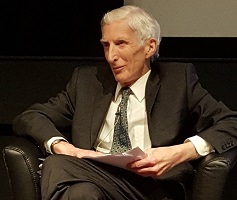 LMR – It’s testimony to the strength of the UK in radio astronomy, dating back fifty years, and I hope it will that the UK is committed to ensuring that the SKA does come to fruition and to having a major stake in it. Of course, there’s a long way to go. 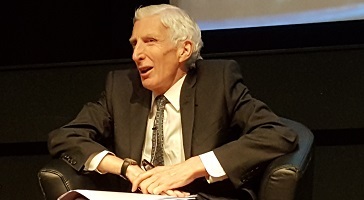 The location for the SKA has not yet been chosen; the two options are South Africa and Australia, and of course it has to be almost a world project in order to justify the cost, but I hope that it will come about on that timescale, and it’s very good that the UK should be a leader in it. GC – Excellent. 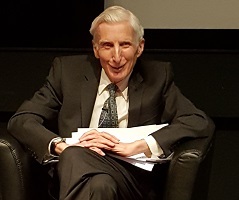 You commented earlier that we would enjoy meeting Darwin more than Newton, that he was a more agreeable man, and certainly you have been a very agreeable man, thank you so much for your time, Lord Martin Rees, it’s been a pleasure. LMR – Very good to talk to you, and thank you very much. 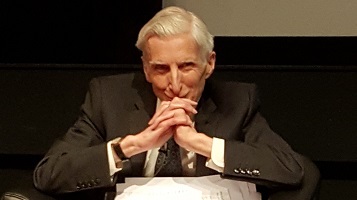 Lord Rees’ books, including Our Final Century, Before the Beginning, and Our Cosmic Habitat, are all currently available.